This is a basic throttle kit for the Predator 212cc. The governor will not be affected by this. Tip! When threading the bolts in, move your wrench or ratchet in either direction a few times, this should make the threading easier - the paint can make it difficult to thread and feel like it's cross threading. Remove the air box assembly, and remove the tube from the gas tank. Remove with a 10mm socket the two nuts holding the air box assembly on. Slowly pull it away - there may be another hose in the back. Now ready to prep the stock linkage for the upgraded kit. ***With a 10mm socket or wrench slightly loosen (about 1/4 turn on) the yellow center nut holding the throttle control. This should to be able to move freely now. Remove the conduit retainer (red circle) and set aside - it's no longer needed. 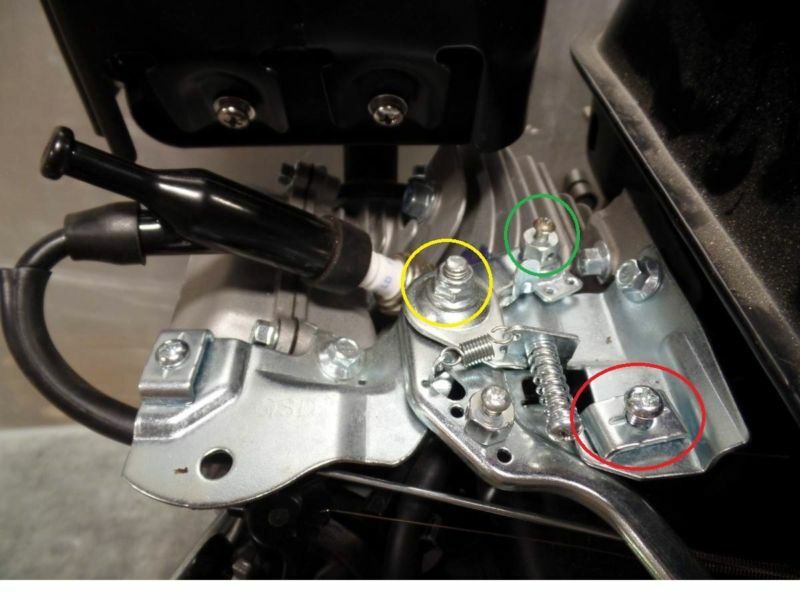 ***Make sure the cable stop (green circle) is loose enough for the throttle rod to go through - do not remove the screw. Remove the top two bolts (8mm socket) on the recoil housing, discard the washers. Start installing the throttle kit by positioning the rod into the cable/rod clamp. Now reinstall the two recoil housing bolts (without the washers). Install the cable through the fitting and into the aluminum cable clamp. You'll need a very small allen key for this. Feed the cable through the top and out the side - you can bend the end of the cable slightly to persuade it to come out the side you'd like. This is where you will also set your tension for throttle adjustment, and the throttle rod will be fastened when you adjust your cable tension. Once everything is tightened up, the throttle linkage moves freely and comes back to idle without assistance. This is a very smooth throttle - if you feel binding, or anything else check the installation again. Now you can re-install the stock air box.